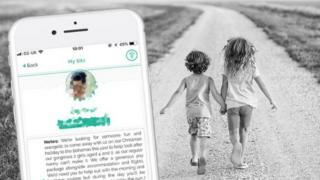 A babysitting app says it has been overwhelmed by responses after a parent posted an ad for a babysitter to join their family on an all-expenses-paid dream Christmas holiday. The position involves spending two weeks in the Bahamas looking after two toddlers at breakfast and bedtime. Bubble said there were “hundreds” of expressions of immediate interest although the app caps responses to 50 so as not to overwhelm parents. The app claims to have 75,000 UK users. The position has not yet been filled said Bubble creator Ari Last, who admitted he had been tempted to apply himself. The advert says the two-week job comes with a “generous pay package” and includes an en suite room and flights plus free time during the day and some evenings. It may sound like a dream break – but the nature of the gig economy can be risky, said Sir Cary Cooper, professor of organisational psychology and health at Manchester University Business School. “I would never advise taking a job without meeting people first,” Prof Cooper said. “Who’s your employer and how reliable are they? But this is the world we live in – it’s app-orientated, it’s short-term contracts to meet demand. Ari Last said the average wage for a babysitter on Bubble is £10 an hour, with the firm taking an average cut of 6% depending on how much work the sitter does.